OK, OK. I held out as long as I could, but my research suggests you all love poop emojis. I’ve resisted until now, because I’m still in the “It’s pretty gross” camp, but I’ve caved. And I have to admit these are pretty cute. In a poopy kind of way. 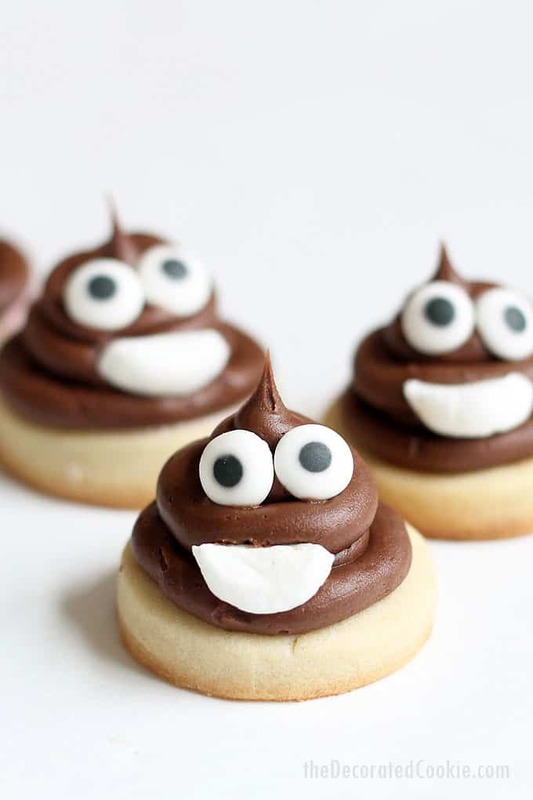 I don’t know why I’m so late to the poop emoji fan club considering I’ve battled intestinal disease for over 20 years. I’m pretty sure the poop emoji is made for people like me. 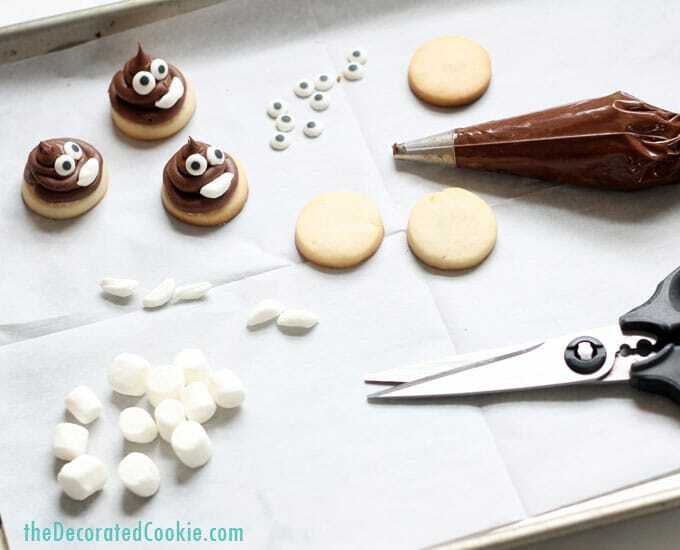 And so, in this post, I’ll show you how to decorate poop emoji cookies. 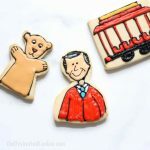 These are really easy to make, and a great cookie for beginners. 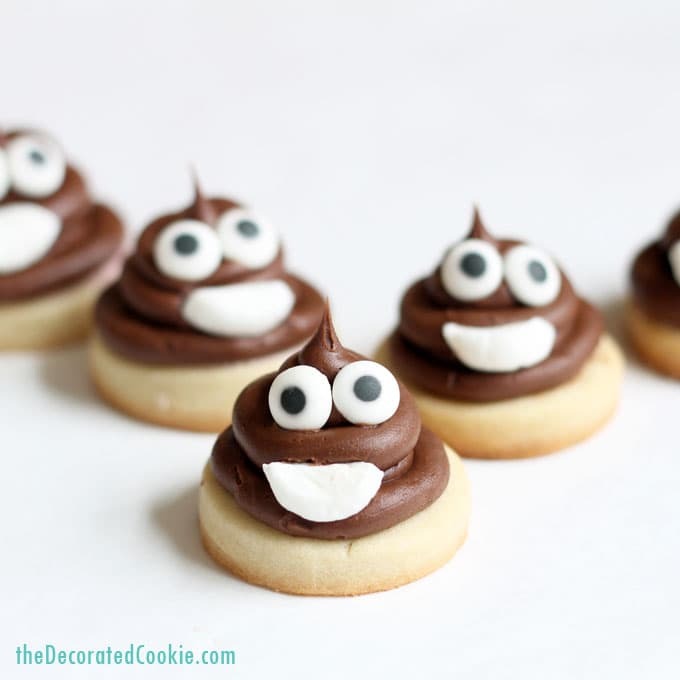 If you’re a fan of these cookies, check out these easy emoji candy pops! A couple of my facebook readers said the poop emoji is supposed to be chocolate ice cream. Now THAT I can heartily accept. But if so, really emoji creator? You didn’t think it’d go down the poop road? 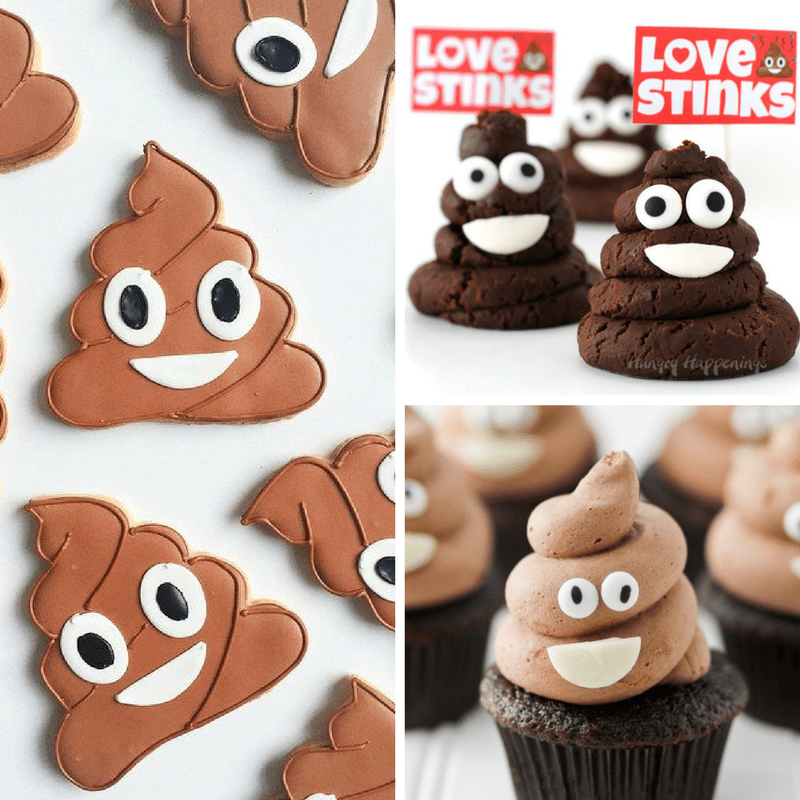 Regardless of your views on the poop emoji, come ON, these are cute, right? And bite-size, so they are much easier to get rid of quickly without thinking too much about it. They are so easy to make. Watch me whip some out in 30 seconds in this video tutorial. Find the full written instructions below. 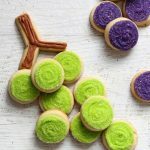 A few notes about these cookie bites. Use buttercream frosting, not royal icing, because you want them to be dimensional, and buttercream just works better for that. You can use store-bought frosting, but just make sure to add powdered sugar to thicken it. After making the cookies, it’s not necessary, but I find it best to refrigerate them. That way, the frosting really sets well and doesn’t sink at all, and handling them is so much easier. After-the-fact I realized I should have used my chocolate cut-out cookie dough (duh). Next time. *Find the decorating bag, tip and candy eyes in the craft store or click the affiliate links above. 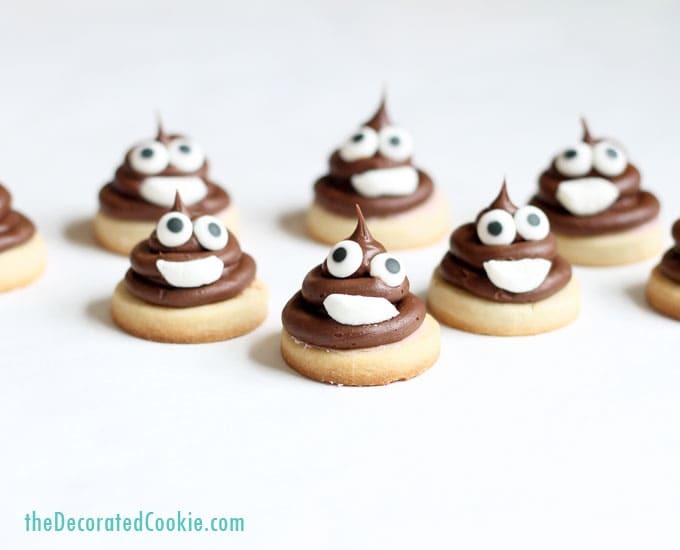 how do you decorate poop emoji cookies? Prepare cookie dough, chill, roll out, cut out circles, bake and let cool completely. Prepare chocolate buttercream frosting (or use store-bought), thickening with powdered sugar so that the frosting holds its shape well. Pour into a decorating bag fitted with the tip and close with a rubber band. 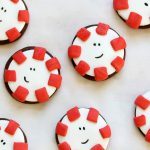 To make the smiles, cut a mini marshmallow in quarters. TIP: For easier cutting, grease the scissors with a bit of Crisco, butter or cooking spray. Pipe a swirl of chocolate on a cookie. Add two eyes and the marshmallow smile. 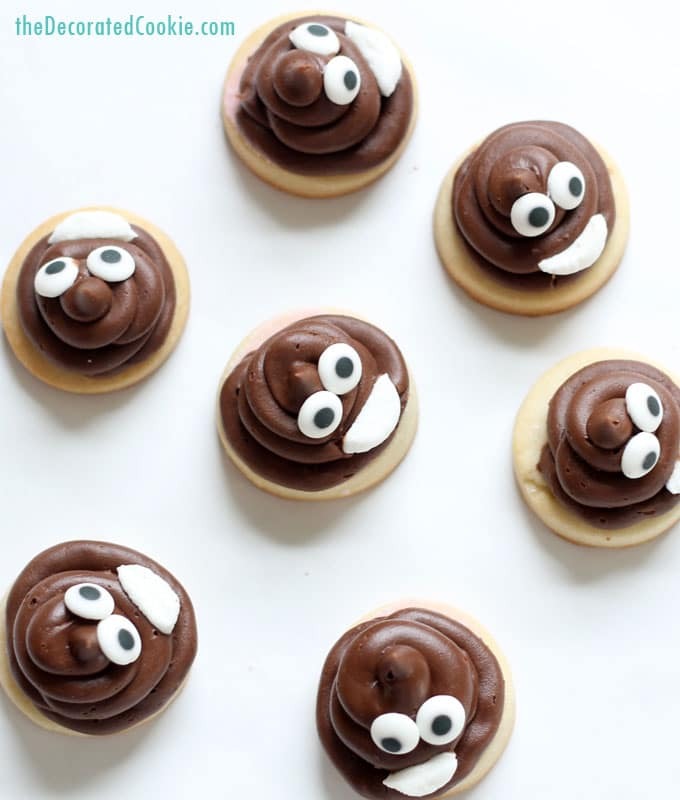 If you like these, check out my roundup of POOP EMOJI FOOD IDEAS.